I like connectedness. I like the idea that people connect images to make moving pictures–to make a film. I like that people connect facts to make stories. I like that people connect stories to make history and culture. I like that we’re all connected to each other in surprising ways. I like that we’re connected to the world around us–to the earth and the animals–in ways that we don’t always acknowledge. I like the sparking moment of connection with a stranger, when you realize you have some small thing in common. I like the glowing moment of connection with a well-known loved one, when you delight in the fact that you have everything in common, more so every day. For your Sunday morning contemplation I’ve gathered a few quotes from wiser minds than mine on the subject of connection. Ready? Begin. So today’s interactive playlist is an exercise in making connections. Here’s how it works. You start with one song, and you connect it to another with any thread you can think of, be it ever so feeble. And then you think of some way to connect that to the next. The connection can be musical, biographical, autobiographical, collaborative, or any mix of any of these. I’ll start. Tom Waits’ Jockey Full of Bourbon is in the opening credits of Jim Jarmusch’s Down By Law. Down by Law is a Clash song. The Clash worked with Mikey Dread (Living in Fame). Mikey Dread has a song of tribute to Bob Marley (In Memory (Jacob, Marcus, Marley)). Manu Chao also has a song of tribute to Bob Marley (Mr. Bobby). Fellow polyglot K’naan has a whole album in tribute to Bob Marley. He has a song (America) that features Mos Def. Mos Def first appeared on the De La Soul song Big Brother Beat. De La Soul appeared on the Gorillaz infectious Feel Good Inc. I’ll leave it at that for now, because the Gorillaz is a good point for somebody else to pick up the thread. You can get anywhere from the Gorillaz!! You know what’s funny? I could have gone straight from Down by Law through Mulatu Astatqe (Jarmusch’s Broken Flowers) to K’naan’s Mulatu Astatqe sampling America. Funny, right? I’m happy with tangents and misconnects. Feel free to start from any song you want. Here’s the playlist. It’s interactive, so add what you like. If you can’t spotify, leave your songs in the comments and I’ll try to add them when I have time. 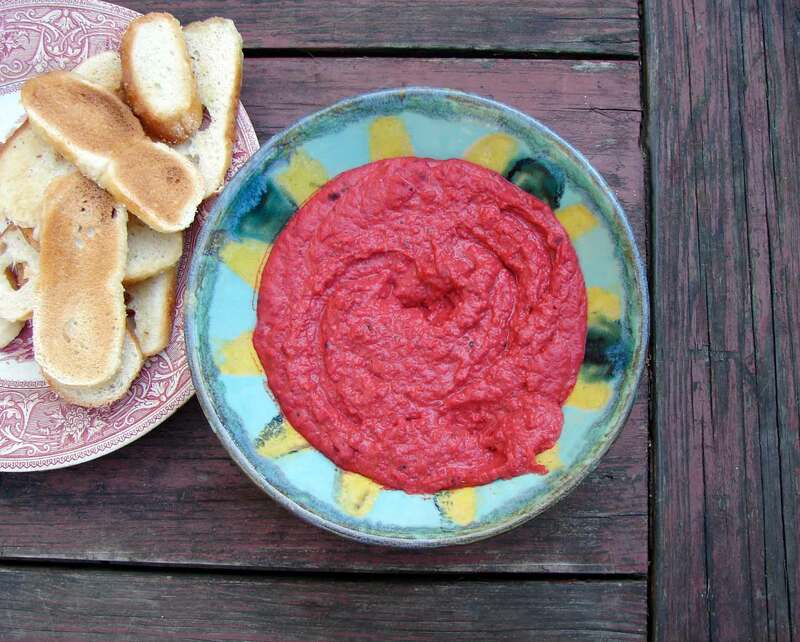 This beet dip was so lovely and simple! I roasted some grated beets, roasted a red pepper, roasted a garlic clove, and tossed it all in a food processor with some herbs and a can of white beans. I added some lime juice, because I think its tartness goes so well with the sweetness of beets. This made a nice meal with some homemade bagel chips. (I bought some salt bagels, but who knew they were so salty? They made good crackers, though, coated with a little olive oil and toasted. So we had that plus some oven-roasted french fries and a big salad. My favorite kind of meal! !